Public Test servers for update 0.8.0 are open! More information about Public Test can be found here. All information about changes in update 0.8.0 can be found in our Developer Bulletin article. Leave your comments regarding this session of the Public Test in this thread. 9k damage per attack plus one fire from the Midway's Tiny Tim rockets against Monarch seems... high. Not completely broken unless there are multiple carriers in a tier X game, but as I understand it there will be. I presume it's impossible to get this much damage against a destroyer due to the rocket circle size - I really hope it is. PT 0.8.0 need a quick update to fix the error about the ships control. Impossible to play in PT for the moment. Also why nothing about the rework of CE ? Same here. Ship controls not working. Manual set other keys to steer forward or reverse dont work too. Fighters lock on to you when arriving, will proceed to chase you even after you leave the circle once they "go active". Unsure if this is supposed to be like this. Fighter map circle doesn't seem entirely accurate, have had multiple instances in which I got targeted by a fighter despite being clearly outside of the circle according to the minimap. Plane control remains incredibly sluggish. OK, i dont know if it's a bug or I'm doing something wrong, but when setting multiple way points my CV ends up going backwards after the first turn. Has happened every game, so I guess it's me, but what am I doing wrong? Cannot control ships, just with autopilot mode. This is bug? Jap T4 CVs need torpedo planes back, flying around with rocket planes only is too boring because Jap Ap bombs are useless at that tier due to the lack of armoured targets. How is the MM supposed to work on live version? Now at PTS we have a very big unbalance with up to four CV per team and even in a fully AA spec Montana or Worcester life expectancy is rather short and its not fun as all focus is on trying to dodge incoming multiple waves of air attacks. Especially when CV gangs up on one ship you can just exit right away since it is not worth even trying. The AA looks spectacular but often feels like its not doing much. Observation: Fully AA spec Montana constant air attacks for about 10 minutes result in 6 airplanes shot down... Not sure if this is just an anomaly or if it broken/supposed to that way. 4 CV's per team is silly, even a fully AA specced Monty, ship and captain cannot do anything against 4 CV's, it's continuous attacks. For live you will have to limit CV's per team, 4 is too high. Why no one is talking about the AA range of the ships being cutted in half? Both the commander skill to extend AA range and the module to extend AA range too, had ben axed. They dont exist anymore. They do "other things" but they don´t extend AA range anymore. All my ships being fully AA upgraded are useless now. This is the last nail in the coffin. 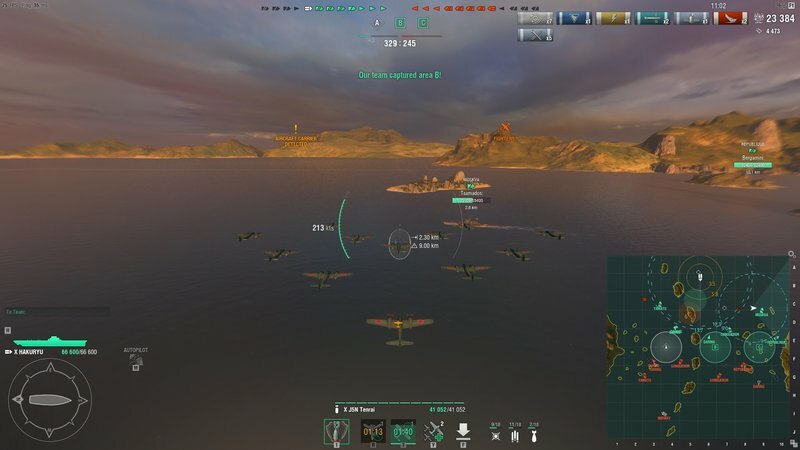 WG clearly wants a plane game, and not a ship game. OK. bye then. I presume it's impossible to get this much damage against a destroyer due to the rocket circle size - I really hope it is. Unfortunately, this is completely possible. Not with the Tiny Tims but the HVARs. They shred DDs and it's much easier to do then executing a crossdrop. It doesn't kill the DD immediately like a crossdrop would but since you can do it over and over again and the DD's AA is no threat to your planes it doesn't really make a difference. Even ships like Kidd and Grozovoi don't shoot down many planes on PTS right now. The japanese rockets are even better at wrecking DDs it seems. What @Bokusatsu_Tenshi wrote is also important. AA range got castrated across the board and even with all the buffs from modules and captain skills the damage isn't enough to shoot down planes. Not that it matters anyway since CVs have unlimited planes now. I think with the lack of fighters the CV gameplay is far more less interesting now, i think it would be great if fighters can be added to the equation, also it would be great if we can actually control our CVs while we're on an attack sortie & not sacrifice our planes just so i can get back the control of the CV. there are t10 ships in the arsenal, for sale for credits. but i played with ranger and Lexington. Well, would love to help testing, but can't log in with my wargaming account, even though I can login on WoT EU, WoWs EU, Forum and wargaming main page - others who have had the same issue? RPF on carriers and their planes? Really?!?!??! - Combine range limit of mid range AA and long range AA for new long range AA to reduce the case of free plane roaming under long range dead angle. -on main server is ok!!! - PT file check done!! no result!! buttons speed UP/DOWN not working!!!!!!!!!! tryed also to hit default: the buttons are empty only for air carriers are ok.
hey, now I can buy t10 ships. the game play is pretty fast, can even hit ships pretty hard. the range of the AA rang is much shorter then in live. i shot down just 8 airplanes, I think that is far too little. oke I think I played 10 games in the new aircraft carriers. the dive bombers I have not yet under control, I think I start the dive too early, the timer mostly expires before I am above the target. but the rockets .... hey is it meant to do so much damage? Is the fighter consumable supposed to follow you across the entire map? Once they "lock-on" onto you they won't let go and you might as well retreat your current squadron as they deal massive damage. 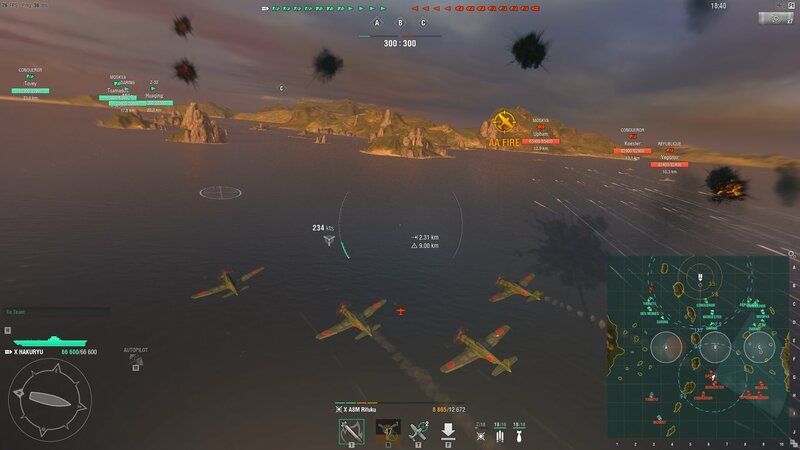 - after ~30+ games, the game play looks easier than current one - The attack round of dive bombers and torpedo bombers look nearly like copy and paste from... Title only for WG Staff (If they will ask for it). I'm not sure if I can write it publicly. - audio - I didn't hear yet anything to complain or praise. - how work spotting of planes returning to ship? - can I calculate some where how big will be compensation for my current CV's? After three (3) attempt to try it (24, 22 and 28 minit) i simply give up. But it looks like it's the same anti progress system, so it's nothing lost.